Listed here is the February Calendar of Events for your information and use. Please find your weekly newsletter here. The Moon is bleeding, a groundhog can tell the weather and where is God in all this? Big things are about to happen in the sky: The Super Blue Blood Moon Wednesday Is Something the US Hasn’t Seen Since 1866. Early Wednesday morning (Jan. 31), a Blue Moon, a total lunar eclipse and a supermoon coincide to create a rare lunar event that hasn’t been seen in North America in more than 150 years. (SPACE.com). Ever since people have gazed at the heavens they have found meaning there – the Sun as a God, the constellations as fortune-tellers. What happens in the sky affects us here on Earth big time. How is your sleep in a full-moon night? As human beings we are part of the natural ecosystem and we suffer and prosper alongside the rest of creation. We adjust to nature’s rhythm because it is our own. Halfway between the winter solstice in December and the spring equinox in March we ask a groundhog what the weather is going to be like. Since 1792 the Farmer’s Almanac has had all kinds of other folklore and wisdom. Also the Almanac reveals an inconvenient truth: Punxsutawney Phil gets his predictions right only 39% of the time. And while everybody understands that the moon is not literally bleeding, let’s not forget the fact that the upcoming Super Moon is not so super after all: the last supermoon and lunar eclipse combination happened on 27 September 2015 and the next one is just around the corner on 21 January 2019. There is something oddly comforting about being subject to cosmological powers. If our fate is in the stars we are not really in charge. Well, the God of Israel does not allow much room for that kind of thinking: Do not let the sun, the moon and the stars guide you! It is much more important to focus on what is going on down here on Earth among God’s children. When people are hungry, feed them! When children need direction, educate them! Next Sunday at St. John’s UCC you will have opportunities to be part of both: We will be kicking off our month-long food-drive as well as celebrate Scout Sunday. So don’t let the stars tell you how to live but instead, support Boy Scouts so they can camp out under the stars! Don’t let some cosmological fate determine people’s destiny but bring food donations and turn people’s lives around! Each year, the United Church of Christ designates one Sunday – usually the last Sunday in January – as a day to recognize the ministries in health and human services provided by the members of the Council for Health and Human Service Ministries as well as those supported by our local churches, ministries which respond to human need with compassion and justice. This Sunday is an opportunity for congregations to lift up our common ministry of healing and service to others in Christ’s name. 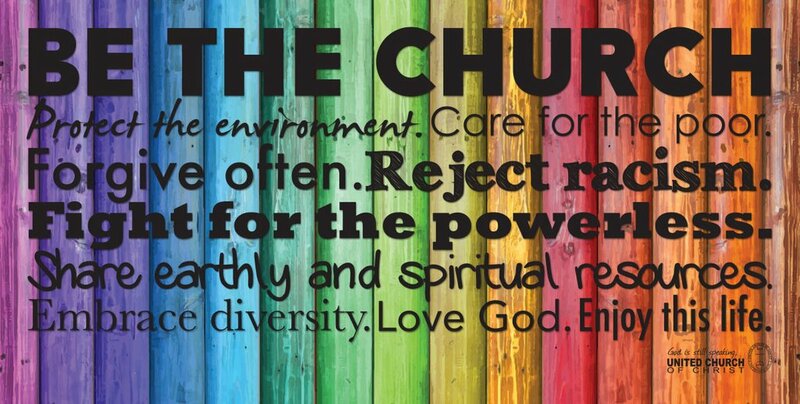 I have been with St. John’s United Church of Christ in Rosenberg, Texas, for 3.5 years now. In this short time frame I have accompanied 5 families who lost a loved one to suicide. It is time we react to this health crisis in our church. That is why we decided to utilize this year’s Health and Human Service Sunday as a Sunday for Suicide Prevention. For our 10 am service on January 28, 2018, I invited Dr. Amy Harkins to co-preach with me. Dr. Amy Harkins is a licensed psychologist working with Easter Seals of Greater Houston in their Mental Health Program. She is able to meet with adults one-on-one for talk therapy that is goal directed, strengths-based and aims to make small, yet meaningful and sustainable changes to improve the well-being and quality of life of her clients. She has worked with elders, Veterans and their loved ones and is currently responding to the emotional healthcare needs of people recovering from Hurricane Harvey. Dr. Harkins has specialized skills in working with clients who have survived traumatic life events and can assist them in healing the emotional wounds that linger after trauma has occurred. Dr. Harkins earned her Ph.D. in Counseling Psychology from Arizona State University in 2005. Dr. Harkins is a wife, mother of two young children and a Monarch Butterfly Rancher. Right after church we will have a table talk in the parish hall. Then and there everybody will have a chance to reflect on their experiences with suicide. Also we will learn how to recognize and support people who are struggling. Please come and learn how to safe lives! As I write this article, I do so seeking your wisdom. The National Council of Churches and our President John Dorhauer have invited us to be a part of the 50th Anniversary of Dr. Martin Luther King’s martyrdom. The gathering place is Washington D.C. The intent is to continue the work begun by Dr. King. Living here in Texas and Louisiana, we know that our nation is engaged in a season of soul searching with much weighing in the balance. Voices have been raised in recent days that seem desirous of taking us back to a time before integration and affirmative action. The national narrative of diversity and inclusion is being strongly challenged. This proposed gathering is an answer to this challenge. The primary question is; Will we in the progressive church rise up and answer this call? So then, I come to all of you. How important do we believe this gathering to be? Getting to Washington DC and staying a day or two will be neither cheap nor easy. Let me describe planned events and then ask for your assistance. Act Now! Envisions three days of events. April 3 begins at 7pm with an inter-faith event at St. Sophia Greek Orthodox Cathedral with a Service of Repentance. April 4th begins at 9am with an interfaith service of Prayer and Preparation at the Lincoln Memorial. Beginning at 10am thru 2pm is a rally on the Mall designed to Awaken, Confront, and Transform our hearts and our institutions. April 5th is Lobby Day with the opportunity to visit your political representatives. I would make the following proposal that we plan to participate in the April 3rd meeting at the Greek Orthodox Church, stay overnight, and then participate in the action on the Mall. Most of us would then make our way back to Texas or Louisiana. I leave you with the following questions. Are you willing to be a “go to” organizational person in your Association? Would you be willing to share in the cost of a chartered bus? Would you be able to spend the night in a local church? Please call the Conference Office at Slumber Falls and share any input you may wish to share. The phone number is 830-625-2212 and you may speak to Stacey Silvey. You can also leave a reply below to share your input. At least once a year, Christians are reminded of Jesus’ prayer for his disciples that “they may be one so that the world may believe” (see John 17.21). Hearts are touched and Christians come together to pray for their unity. Congregations and parishes all over the world exchange preachers or arrange special ecumenical celebrations and prayer services. The event that touches off this special experience is the Week of Prayer for Christian Unity. 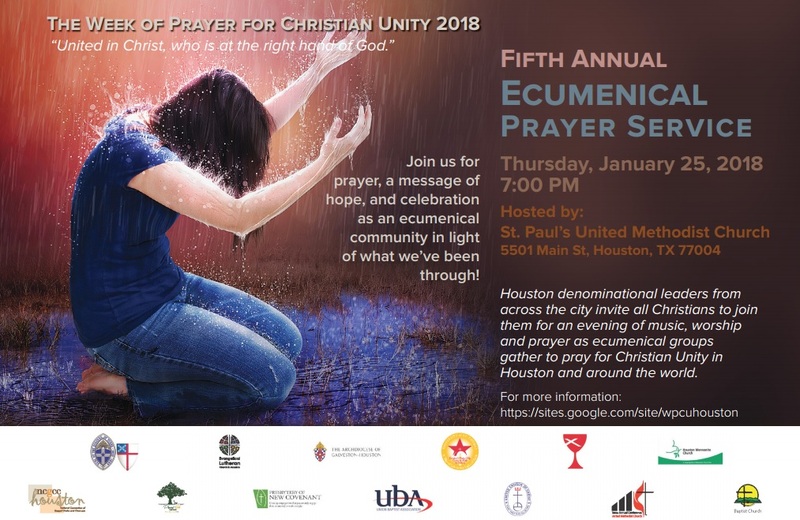 In the greater Houston area we are gathering for our 5th Annual Ecumenical Prayer Service during the Week of Prayer for Christian Unity on Thursday, January 25, 2018 at 7:00 P.M. 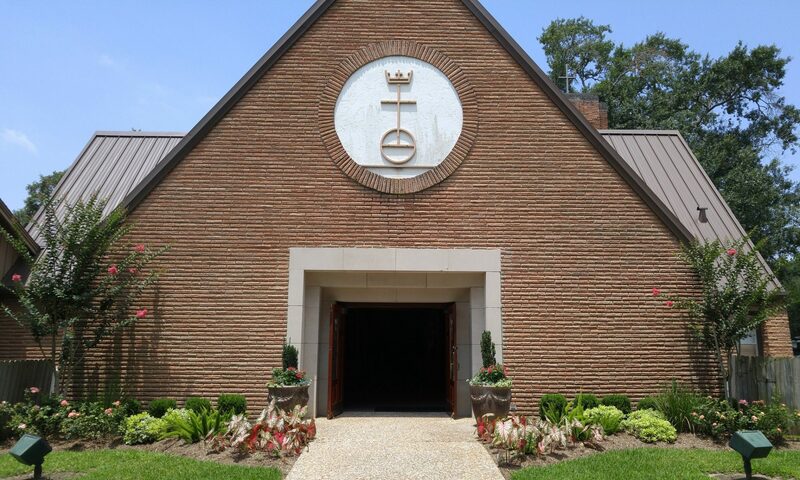 This year’s Host Location is St. Paul’s United Methodist Church 5501 Main Street, Houston, TX 77004. This year’s theme was created by our ecumenical partners in the Caribbean. Today Caribbean Christians of many different traditions see the hand of God active in the ending of enslavement. It is a uniting experience of the saving action of God which brings freedom. For this reason the choice of the song of Moses and Miriam (Ex 15:1-21), as the motif of the Week of Prayer for Christian Unity 2018 was considered a most appropriate one. It is a song of triumph over oppression. This theme has been taken up in a hymn, The Right Hand of God, written in a workshop of the Caribbean Conference of Churches in August 1981, which has become an “anthem” of the ecumenical movement in the region, translated into a number of different languages. Singers are invited to help us demonstrate Christian unity by ministering with us as an interdenominational choir for the Week of Prayer for Christian Unity’s Prayer Worship Service. Prayer Service Choir Rehearsals will be on Tuesdays, January 16th & 23rd, 2018 @ 7:00 p.m. @ St. Paul’s United Methodist Church. Please do not hesitate to join! The Week of Prayer for Christian Unity is a time to come together to pray in common and encounter one another as brothers and sisters in Christ. It is an opportunity to recognize the richness and value that are present in each other as we join Christ’s prayer, “that they may all be one” (John 17:21) All are welcome!